In the world of Blu-ray players you get what you pay for, and if you're after the very best in Full HD detail, Panasonic is definitely the brand to head for. In terms of picture quality from all sources, there are no better choices than the DMP-BDT230. In the world of Blu-ray players, you get what you pay for, and if you're after the very best in Full HD detail, Panasonic is definitely the brand to head for. As such, the Japanese manufacturer's mid-range DMP-BDT230 could be star of the show this year. It lacks the second HDMI input, the (frankly pointless, for most of us) Ultra HD 4k upscaling of DVDs, and the dedicated analogue outputs that the step-up DMP-BDT330 includes. But what it lacks in dedicated and future-proof home cinema features, it makes up for in an otherwise generous feature count and its cutting-edge hi-def images. We've been impressed by the company's My Home Screen innovations in 2013 on its TVs that make smart apps more personal and customisable, but there's a no-show for all that on the DMP-BDT230. Sadly, in their place come last year's VIERA Connect screens, a collection of apps presented in a seriously outmoded fashion. Accessed via the oddly-named Network Services tab (sounds like a call centre to us), VIERA Connect includes everything from BBC iPlayer, YouTube and Netflix to iConcerts, CNBC Real-Time, Euronews, Daily Motion, Aupeo, PlayJam Games, Twitter and Facebook. There's also a link to a Marketplace where even more apps can be downloaded. There's no Lovefilm app, but the headline is Netflix, which is underlined by the presence on the DMP-BDT230's remote control of a dedicated big red button for the online streaming service. That we like, though the DMP-BDT230 could soon look a little silly if the wind blows in another direction and Lovefilm, or something else, becomes dominant. In terms of looks and physical features, the DMP-BDT230 sticks with the traditional gloss black, though it's extraordinarily slim (just 38mm tall) and should fit snugly into any AV rack already groaning with gear. It's angled inwards at the sides, too, adding to the slimline appearance. Around the back it's all pretty simple, with a single HDMI output accompanied by a digital optical audio output (the DMP-BDT230 deals in PCM or bitstream, and supports all Blu-ray surround sound formats, such as DTS Neo:6, DTS HD Master Audio and Dolby Digital True HD) and a wired LAN port, though the DMP-BDT230 does have a WiFi module. We're so glad that the dreadful days of the dongle are (almost) over. The front contains the most excitement in the form of an SDHC Card slot. 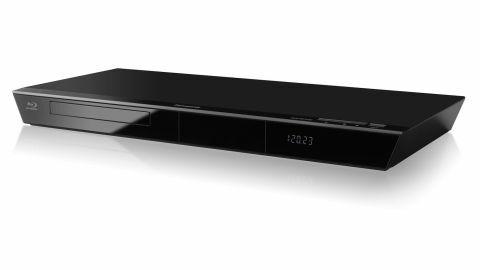 Panasonic Blu-ray players, DVD decks and TVs have long featured one, but we're glad to see it continuing even if it only supports playback of music and photos. No matter, because the DMP-BDT230's two USB 2.0 slots are nestled-up next to it, all under a kick-down flap. There are a few changes from last year's almost-identical crop of Panasonic Blu-ray players. The DMP-BDT230 doesn't have a touchpad remote, as its forbears of 2012 did, but the same simple directional user interface remains. It's actually very, very easy to use – it's just a case of relying on the excellent, simple remote control's arrow keys – not even the OK button is needed – but what's happened to Panasonic's awesome new smart TV pages for 2013? The built-in web browser isn't worth bothering with, largely because the DMP-BDT230 comes with a rather basic TV remote – welcome though it is – that makes navigation of web pages, and text entry, painfully slow. Use a smartphone instead; after all, the DMP-BDT230 also comes equipped with Miracast for linking directly to Android devices. Aside from its simplicity, where the DMP-BDT230 does impress is with its support for digital media. In our test we managed to get the DMP-BDT230 to display AVI, MP4, MPEG-4 and AVC HD video files, JPEG photos and MP3, WAV, AAC, FLAC and WMA music files. Disc loading times are fair; the DMP-BDT230 managed 12 seconds in Quick Start mode, with both DVDs and CDs clocking-in at less than 15 seconds. Picture quality is where the DMP-BDT230 really excels. You should stick with the hassle-free Normal, Soft or Fine picture presets, though there's little need to move away from the default Normal; pictures from our 2D test disc Extremely Loud & Incredibly Close were pin-sharp and fluid, with zero video nasties and very little judder. In fact, its 24p images are smoother than we've ever seen. Switch to a 3D run-through of Hugo and the DMP-BDT230 copes just as well, delivering depth-filled images with no crosstalk or image echoes to frustrate us. Colour and contrast in both 2D and 3D impress, as they do in some remarkably well upscaled fare from our test DVDs. In terms of picture quality from all sources, there are no better choices than the DMP-BDT230.